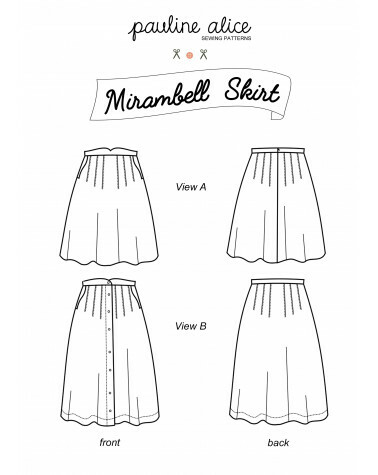 The Mirambell skirt is a high waisted pleated skirt with shaped pockets. View A: above-the-knee length with invisible zipper in the back. View B: knee length with front button closure. Also includes an A0 copyshop PDF. Bea is wearing a size 36 and measures 1,70 m (5 ft 7). Pauline alice patterns are designed for a B cup bust and an average height of 1,65 m (5 ft 5).